You’re about to go in an unexpectable journey, become a Monster while living an incredible underwater adventure. Have a lot of fun, make new friends and learn how to dive or improve your skills. Glide over colorful reefs and meet plenty of wonderful marine life. Monster comes originally from the Latin word monstrum, associated not only with scary things but with marvelous and prodigious, and also applied to someone who was very well disciplined. In a funny way and after lots of students were certified as monsters, it became our name. 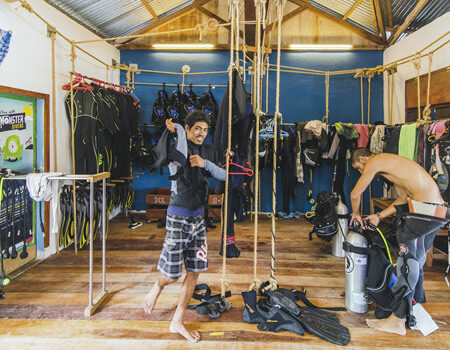 We are three friends from Spain and our local friends, who have built this new dive shop in Pulau Weh to show under our own standards and point of view the beauties of the marine life in Pulau Weh and the incredible feeling of being underwater. Safety and being environmentally careful and correct are our main concerns, mixed with fun and proper teaching for our students. All our courses and educational programs complete the Padi standards and are taught by experienced instructors who will adapt every course to the needs of each of our students, to achieve proper learning and in order to make you feel completely safe and secure while diving. No worries about how old or how experienced you are, if you are thinking about learning to scuba dive, Pulau Weh and Monsterdivers is the perfect place to do it! We also have some fun and good experiences to offer to the ones who have already discovered the pleasures of diving. A group of local guides and the four monsters with thousands of dives in the area will show you every creature that’s possible to find around this spectacular place. So now knowing a bit more about us and taking for granted the stunning marine life of Pulau Weh, why you shouldn’t come and visit us? Pulau Weh is a western island of Indonesia just at the top of Sumatra, with a jungle domain where humans have created some small villages centered in the historical port of Sabang. Being at the intersection between the shallow and warm waters of the Andaman Sea and the really deep blue and cold waters coming from the Indian Ocean gives the island’s water very special conditions. This contrast between sea and ocean, the currents and the flow of nutrients creates a perfect habitat for a huge range of different life, the exuberant coral reefs and fields of fan corals that embrace species from the small reef creatures and fishes to the bigger turtles, reefs sharks and rays. 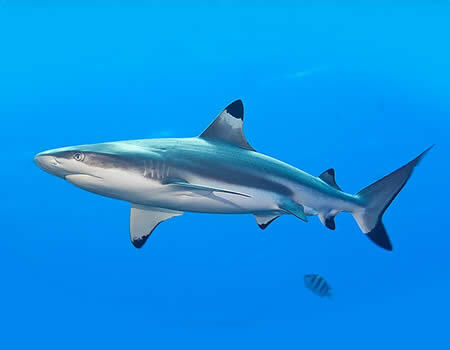 It also welcomes large migrating animals like manta rays, oceanic sharks and the larger mammals such as dolphins and whales. Mix this with very clear waters and visibilities that can go up to 40-50 meters, year-round diving, the easy and convenient access to the island and the magic touch that the staff of Monster Divers will add to your experience, and you will have the answer to why you should come and enjoy diving with us. Dive in Pulau Weh with Monster Divers!